These procedures have been developed to aid researchers at the University to manage risks associated with transportation of radiation sources, and provides information on legislative compliance. Carrier - any person, organisation or government undertaking the carriage of radioactive material by any means of transport. Carriers must have a licence to transport radioactive goods. Containment system - the assembly of components of the packaging specified by the designer as intended to retain the radioactive material during transport. Package - the packaging with its radioactive contents as presented for transport. 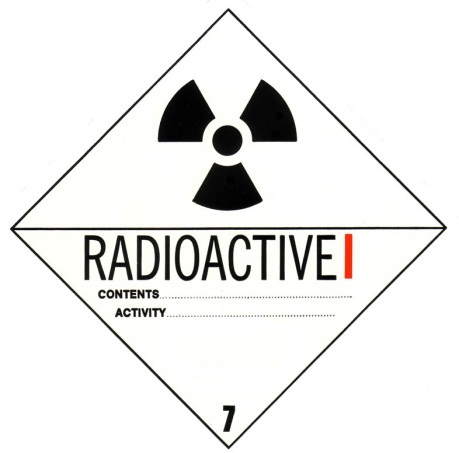 The types of packages used are selected according to activity levels and material restrictions specified in the Safe Transport of Radioactive Material (2014). Packaging - Packaging shall mean the assembly of components necessary to enclose the radioactive contents completely. It may, in particular, consist of one or more receptacles, absorbent materials, spacing structures, radiation shielding and service equipment for filling, emptying, venting and pressure relief; devices for cooling, absorbing mechanical shocks, handling and tie-down, and thermal insulation; and service devices integral to the package. The packaging may be a box, drum or similar receptacle, or may also be a freight container, tank or intermediate bulk container. These procedures document the current requirements for UQ researchers transporting radiation sources to manage their safety and legislative compliance risks. Licences to possess radioactive substances are held by a number of University Schools and Research Centres under Queensland's Radiation Safety Act 1999 and Regulation 2010 (available via the Qld Radiation Health website). These licences allow the possession of various types of unsealed radioactive sources used in research activities. 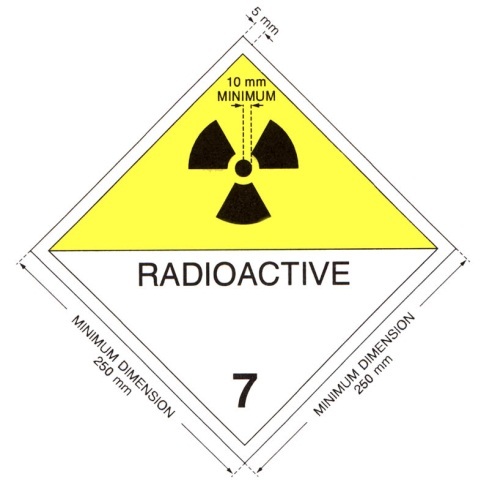 Occasionally, radioactive materials may need to be transported between University campuses or consigned for shipment within Australia or overseas. Radiation possession licences have also been granted to specific areas within the University for the possession and use of major sealed sources, some of which are incorporated in portable devices for which transport forms an integral part of their use. The holders of possession licences have obligations to ensure that radioactive substances and sources are consigned and transported in compliance with State and Commonwealth legislation, international guidelines, and their approved Radiation Safety and Protection Plan. ARPANSA provides clear detailed guidance for the safe transport of radioactive material in the Safe Transport of Radioactive Material (2014). Radioactive materials are a class of dangerous goods and may require placarding if transported in a vehicle. In some cases, the Regulator will need to pre-approve the transport of some materials. The Safe Transport of Radioactive Material (2014) requires special packing requirements and is quite complex. 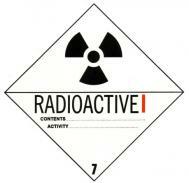 Before you arrange to transport any radioactive material contact your local organisational area RSO or the UQ RPA. These procedures also apply when tranporting radioactive substances from one building to another within the University, where a vehicle may be used to transport between buildings in the one campus, or between different sites and campuses. In Queensland, prescribed radioactive substances may only be transported by road or rail under the authority of a licence granted under the Radiation Safety Act 1999 and Regulation 2010. Licences granted under the Act are conditional on the user complying with the relevant sections of the Safe Transport of Radioactive Material (2014). This code is published by the Commonwealth and has been adopted by all Australian states and territories as the standard regulatory document. The Act provides that for road transport, the person in charge of the vehicle must personally hold a licence authorising transport. However, persons transporting excepted packages or certain devices such as soil moisture and density gauges are exempted from the requirement to hold a transport licence provided the transport is in compliance with the Code. For air transport, Commonwealth legislation (The Civil Aviation Act 1988) or the International Air Transport Association’s Dangerous Goods Regulations are applied as appropriate. For marine transport outside state and territorial waters, the current edition of the International Maritime Dangerous Goods (IMDG) Code must be followed. Transport of radioactive materials via waterways under the jurisdiction of States and Territories is covered by the ARPANSA Safe Transport of Radioactive Material (2014). Marine transport of Dangerous Goods generally is also covered by the Navigation Act 2012. Most of the regulatory Codes are derived originally from the International Atomic Energy Agency’s Regulations for the Safe Transport of Radioactive Materials. Because their content is substantially the same, these regulatory documents will be referred to collectively as Codes in this guideline. Requirements for packages containing fissile materials. More specific requirements about the package types are listed in the Code based on the radionuclide and the activity. Package labelling is determined by the external radiation levels at the surface and at 1 metre from the package. Excepted package - the requirements for external labelling may be relaxed in favour of an internal label, visible only when the package is opened. Requirements for completion of a shipper’s declaration are also waived, but the nature of the shipment must still be noted in the transport documents, i.e. the consignment note, air waybill or bill of lading. In addition, a person transporting an excepted package is exempted from the requirement to hold a transport licence. Type A package - Almost all unsealed sources dealt with in University laboratories are able to be transported in Type A packaging. Essentially, this is packaging which is able to stand up to normal transport handling but which is not intended to provide a high degree of security under accident conditions. There is no system of certification for Type A packaging but the Codes do specify design requirements and these will need to be taken into account if new packaging is to be prepared for a specific purpose. Type B (U) package - For high activity sources which require high security - these have to be specially certified by national competent authorities for transport. Type B (M) package - For high activity sources which require high security - these have to be specially certified by national competent authorities for transport. Type C package - For high activity sources which require high security - these have to be specially certified by national competent authorities for transport. Type IP‑1 (Industrial package Type 1). Type IP‑2 (Industrial package Type 2). Type IP‑3 (Industrial package Type 3). Frequently the packaging in which a source was originally shipped can be reused, provided it is undamaged and is appropriate for the material to be transported. Where there is any uncertainty as to the type of package required, the UQ RPA should be contacted at the HSW Division for advice. The labels must be 10 cm on each side and must be filled out with the name of the radionuclide and the activity using SI units i.e. becquerel (Bq). Templates for Category I-WHITE, Cat. II-Yellow and Cat.III-Yellow labels are presented in Fig 2, 3 and 4 of the Code respectively. These labels are available from your local RSO, the UQ RPA or the UQ Chemical Store. With the category II YELLOW and III YELLOW labels, the Transport Index (for TI values, see para 536 and Table 7 of the Code) must also be shown: this is 1/10th of the radiation level at 1 m from the package in µSv/h. For example, a package with a radiation level of 25 µSv/h at 1 metre would have a TI of 2.5. The 1/10th fraction is a legacy from an earlier measurement system. For each package or overpack other than excepted packages, the UN number and the proper shipping name shall be legibly and durably marked on the outside of the packaging in addition to any other requirements (see Table 8 of the Code). In the case of excepted packages only UN number in addition to any other requirements is required on the outside of the package. Licences which authorise the use of unsealed radioactive substances for research do not usually include a transport authority: unless transport is specifically authorised by the user’s licence (as with soil moisture gauges) only sub-licensable quantities may be transported. Where the shipment is being consigned with a commercial carrier a shipper’s declaration is required to be completed. 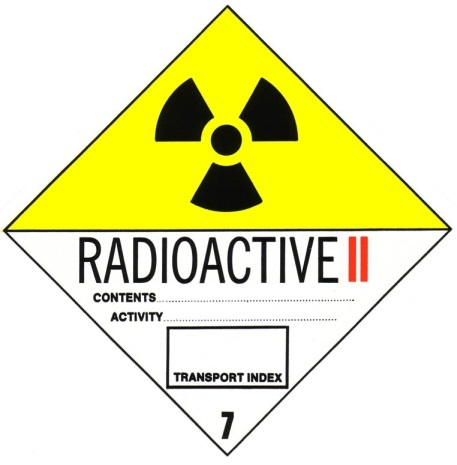 Details of the information required in a declaration are given in the Safe Transport of Radioactive Material (2014) applicable to the mode of transport. Declaration forms are obtainable from licenced carriers or airlines. The UQ RPA should always be consulted for advice on filling out the form as there can be pitfalls, particularly with the air transport forms. Persons currently certified by IATA to package goods for air travel must be consulted if shipments are to be sent by air. Personal vehicles must not be used to transport dangerous goods and if hire vehicles are to be used, you must check with the hirer that transport of radioactive materials is permissible under the terms of the hire contract. Only sub-licensable quantities may be transported if packaged in accordance with standard. The package is to be secured in the vehicle at a distance from the driver consistent with minimising exposure to radiation. For example, an Excepted or category I WHITE package will not require significant separation from the driver, but a package requiring category II YELLOW or III YELLOW labelling should not be carried in the passenger compartment of a sedan or in the seating area of a station wagon. For all packages, other than those classed as Excepted, the vehicle must carry a warning placard on the rear and each side. 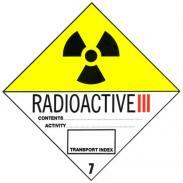 The placards must be of the kind specified in the Safe Transport of Radioactive Material (2014). Where the vehicle is carrying a soil moisture/density gauge or hydrology probe, the instrument must be carried in the special designed transport case with the source secured in the off position (if applicable). The case must not be stowed in the passenger compartment or seating area of a station wagon and will need to be secured against movement - particularly important when carrying a gauge in the tray of a truck. Placarding as described above is required when transporting all soil moisture/density gauges and hydrology probes. In general, packages containing radioactive materials shall not be transported in the same vehicle with other dangerous goods, and never in food or drink containers. Exceptions to this rule are made in the case of non-flammable non-toxic gases (dangerous goods class 2.2), poisonous gases (class 2.3), poisonous substances (class 6) and miscellaneous dangerous goods (class 9). An emergency advice placard (available from your RSO or the UQ RPA) is to be carried in the vehicle when transporting radioactive substances. In the event of a vehicle accident the essential requirement is that except for actions necessary to save life, or to give other necessary medical assistance, access to the vehicle and its immediate surroundings is to be restricted until appropriately trained persons can reach the site. This is all that is necessary where only sub-licensable materials having an inherently low hazard are carried. Transportation of licensable quantities will require more detailed procedures and the UQ RPA should be contacted for advice as to material to be incorporated into their emergency advice placard/manual and Radiation Safety and Protection Plan.